Since I have been engaged in the redesign of my site over the last month, I thought that I will share some current principles and tips on good web/blog design. These were based on actual questions I was asking myself during my own process, as well as the resources I used. Although I've managed numerous ICT projects for NGOs, clients or governments, I've left most of the design work to the vendors (which as project manager, I should, anyway). But it is really when I am knee deep with my own site that I learn the most about design, and I'm constantly amaze at how many principles remain constant, how many others evolve or get created, and how some remain hotly debated. The analogy might be that of decorating a house with furniture (where do I place what), as opposed to the actual construction and engineering of the house. You can read more at BitwiseLogic's post. Then I also looked around for sites which design I love, as well as the best and most popular Blogger or Wordpress templates. (easy enough to Google) They help me streamline my own design, adopting ideas I like, and throwing out those I don't. For me, speed was crucial because many audience will be from developing countries, and also, I'm a believer of simple design (which is also fitting for a professional site), so graphics and flash are banned unless they add to the content. This part belows partially to the web development bit, but I will say that in 2010, choosing a popular, well supported CMS, and one you can edit through a browser as well, is the way to go, as opposed to designing something from scratch and uploading via, say, Dreamweaver. I also wanted that was open and met web standards. I will leave the details to a later post on web development. Smashing magazine has some good general design princples in several posts, such as the one here and this one on usability here. When I wanted more details on any one of these elements (or others that might not be here, like designing to be mobile-friendly), I Googled for more resources. I also should have looked at other factors like accessibility but didn't. Then I used a templating site like Blogger or Wordpress to design my site. This worked for me because my design was simple. For more complicated design you can use Dreamweaver or another web authoring software. By far, this was the hardest of the process. Secondly, importing blog posts were another headache. For blogs that I could export, I lost many of the comments, formatting, and I also wasn't able to search the imported blog posts. I was spending too much time on this issue, so sadly, I looked for an interim solution (so that I can have a live site that I can also update with new content) while this migration phase is worked out. So I resorted to using Google Sites and Blogger (both not open source software, nor is independent hosting allowed) in the interim. I don't know how long this will last, or if I have the stamina to tackle the migration issues without external help. So that is where I am now! The Lund University Initiative on Legal Empowerment of the Poor is organizing a conference 3-4 March 2010, which will explore the legal dimension of the initiative. The Conference is organized by LUCSUS – LEP in collaboration with University of Oslo, SUM -ANLEP. Conference information available on the website for Lund University Initiative on Legal Empowerment of the Poor. (Updated 4/20/2010: Conference agenda and materials are now available here at the Lund-LEP website. In June, 2008 the Commission on the Legal Empowerment of the Poor (CLEP) issued its final report entitled "Making the Law Work for Everyone". The Commission developed a comprehensive framework for legal empowerment, focusing on indigenous peoples, women and vulnerable groups, with four mutually reinforcing pillars: access to justice and the rule of law, property rights, labour rights and business rights. The Lund initiative also seeks to expand the scope of legal empowerment and will therefore advocate an inter-disciplinary approach to Human rights. This is chiefly done by integrating two additional dimensions into the pillars: the relationship between the national and the international; and the relationship between society and the environment. Note: I've taken the liberty to adapt his findings from his Powerpoint file and my comments are in italics. Poor people have no alternatives I appreciate this human dignity approach, although, it does depends on what the issue is, or how deep in poverty the particular people are. His example is in semi urban Bangalore, but I have witnessed certain poor communities in villages or hilltribes that have little alternatives to inexpensive and reliable information. However, a GENERAL assumption that poor people have no alternatives is wrong. Needs are more pressing than desires His point is that most needs of poor people are not technologically related, but that actually they are willing to spend more proportionally than the urban rich on technology. I do agree, although it does depend on what poverty level they might be in. Needs translate to business models. there are certainly many more factors than needs that are in play here. Just reflect on ourselves who have individual needs, but we certainly don't start a successful business per se in response. If you build it, they will come. This is the classic India 'Hole in the Wall' example. They might not come for a variety of reasons: lack of knowledge, lack of local content, lack of resources, political or social reasons, etc. Worse, sometimes, if we build it, it might stifle local entrepreneurship. ICT undoes “rich getting richer." ICT itself does not. At best, it merely amplifies the social and economic problems that the poor are already facing. Technology permits socio-economic leapfrogging. Only if the right social economic and politcal conditions are in place and technology is applied appropriately. Hardware and software are a one-time cost. If only- in fact in most of my previous programs, best practice has shown that tech itself (hardware/software) is only about 20% of TOC (total cost of ownership). We usually budget an extra 80% for training, technical support and overcoming the challenges of social/economic/political factors for adoption. Automated is cheaper and better. Another technology determinism track. Information is the bottleneck.International Development is like a chess game that is being placed in 4 dimensions. It is very hard to identify a 'bottleneck' correctly. There is usually not a 'bottleneck' per se anyway, most problems are dynamic and interrelated. Why then do we have this attitude? Technology amplifies human intent and capability. Technology requires support from well-intentioned, competent people or organizations. For successful ICT4D, partner with competent, organizations or be prepared to build your own. I think that this Powerpoint is pretty spot on, and those are usually the attitude adopted by people coming from a technological or even economic discipline (vs. a social one). However, after a short time in the field, these myths will soon start to dissipate. I hope to catch Kentaro Toyama at the iSchool for a deeper chat soon. People who both understand grassroots development needs and are proficient in ICT. Academics who are interested in the field. However, I think that there might be some oversimplification for the sake of straightforwardness. Moreover, the article might create some controversy, because it seems to imply that the first category (#1) of writers carry the most credit. Great article still, because I don't believe that anyone has taken the effort to survey the web space even as ICT4D as a field has matured. After several months of dedicated analysis and writing about how ICT for development is covered on the web, here are some thoughts about the online availability of information about ICT4D – from academic articles, to conversation, commentary, and citizen media reflections on what works, what’s difficult and what is worth sharing. It is...relatively difficult to find blogs and citizen media content from unaffiliated individuals, and from those who experience the benefits, and sometimes challenges of internet technologies in developing-world contexts. While there are scattered discussions and commentaries, sustained, community-driven dialogue is not easy to find. This is perhaps not surprising, given the often complex and technical nature of the field. There has been tremendous improvements in internet access and explosive growth of cell phones in developing world, as Matthew Smith outlines in his essay for IDRC/Harvard’s latest conference,Communication and Human Development: The Freedom Connection? in September 2009. However, GV’s research (led by Aparna Ray and John Liebhardt) has found ambiguous evidence of online discussion of these themes that advances beyond well-worn anecdotes of fishermen with mobile phones. Those discussions surely exist, if not online; a look at the Manthan Awards in South Asia, for example, gives us a window into communities of practitioners in this field, and the focus of their work. People who both understand grassroots development needs and are proficient in ICT. A very small percentage of online writers fall in this category. These people have the skills to develop tools/ techniques, speak the language of ICT4D, and are able to get exposure for their projects. Academics who are interested in the field. They are able to develop concepts in ICT4D, and mostly run small research projects to prove/ disprove their hypotheses, build concepts, and make predictions. There is a lot of energy here - perhaps why we saw so many research papers in our web searches. These people explore and predict trends, but are not often in contact with grassroots folks, and rarely implement projects. Everyone else either comes from the ICT community, and open to designing tools for development/ social projects, or people working in the development sector who need ICT solutions but have relatively low/ no knowledge of ICT. These two sets of people do not usually speak the same language. Broadly speaking, many development experts seem hesitant to learn technical skills and languages. They may want a ICT solutions, but there are numerous obstacles to engagement, including expertise, time, resources, and organizational culture. 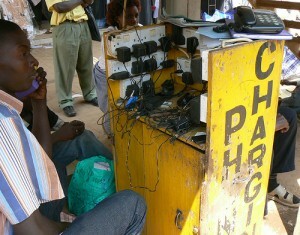 Hence ICT experts sense that development practitioners are rarely clear about helpful solutions. You can see the organizational chart here.